Head up into the Cloud Room for delicious outdoor drinking. 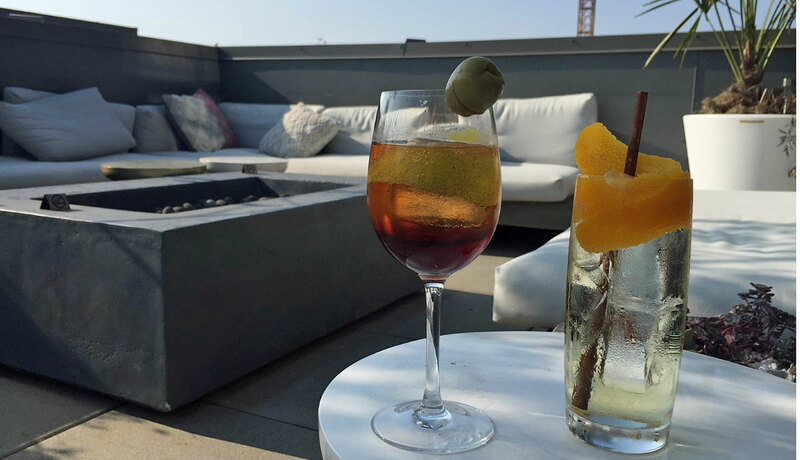 Whether we have a full blaring sun or one of Seattle’s particular cloud-and-sun combos, there’s something about summertime that makes me want to have a cocktail outside. Of course, just starting to drink on the street probably isn’t going to end in a happy manner – luckily, Seattle boasts an amazing array of bars that have outdoor drinking areas. Five favorites are below. The Cloud Room, 1424 11th Avenue Ste 400: As the Cloud Room (which also has a co-working office area) started in a more private capacity, I’m not sure all know the bar is now open to the public – and has an amazing fourth floor deck, with comfy couches matching the interior’s all-kinds of cool low-slung couches, Berber-ish carpet, and 60’s Parisian loft feel. However, the finest reason to stop by is legendary, and always-charming, bartender Jay Kuehner, who whips up European-inspired aperitvo cocktails and any classics you can think of. I had my favorite refreshing sipper of recent memory there, a Vermouth Spritz with Yzaguirre Rojo Reserva Spanish vermouth, Pierre Ferrand curacao, Angostura bitters, Cava and sparkling water. Percy’s, 5233 Ballard Ave. NW: While sitting inside means you can catch the cocktail-making and the many intriguing ingredients in this apothecary-esque spot up close, when the weather is hot, you must head to the patio. It’s an ideal spot to duck out of downtown’s Ballard’s hustle and bustle. Under the sunlight, I suggest you try to the Simone’s Love, which cuddles up dill-infused vodka (dill and summer is a nice combo), lime, and soda. No Anchor, 2505 2nd Avenue: This Belltown bar’s tiki-rific sibling (and neighbor) Navy Strength just won Best New American Cocktail Bar (yeah! ), but don’t think that means you should pass this haven of weird beer by when you’re on your outdoor drinking tour. Their sort-of triangular patio is a wonderful place to drink under open skies whether you’re having Oregon’s Pfriem Kölsch, with its pear-y, floral notes, or their Cascade+Galaxy Gin and Tonic (don’t forget: No Anchor has an inventive cocktail list to go along with their beer). 2 Fingers Social Club, 9211 Delridge Way SW: The bright and shiniest outdoor boozing spot on the list, 2 Fingers only unveiled their front patio a few weeks ago – and the folks coming into this neighborhood favorite bar couldn’t be happier. You might find bands, you might find movies being shown (they love the cult-y cinema), and you’ll definitely find happiness if you order up a classic Dark and Stormy. With Goslings Black Seal Bermudan rum, lime juice, and ginger beer, it’s a traditional tipple for higher Fahrenheit days. St. John’s Bar and Eatery, 719 E Pike Street: With a memorable backyard getaway (a patio with a large arching tree above), this Cap Hill bar has long been one of my favorite nearly magical cocktail swilling places, as it feels like you’re traveling much farther than a few feet when you walk back off the busy street and find yourself amidst the dinosaurs. Having a Rhubarb Fiz with vodka, a vinegary rhubarb shrub, lemon, honey, rhubarb bitters and soda only serves to increase the magical sunshine feeling.